Elizabeth Quinlan holds a PhD in Interdisciplinary Studies. She holds a faculty position in the Department of Sociology, and is an associate member in the Women’s and Gender Studies Program, at the University of Saskatchewan. Her program of research lies in the intersection of gender, health, and work with special emphasis on the historical fluidity of gendered definitions underpinning formal and informal caregiving. In the fullness of time, we now know not all women conformed to that image. One such group of women – the Ladies Auxiliaries of a Canadian mining union, the Mine Mill and Smelter Workers (MMSW). These wives, mothers, and daughters of hard rock miners helped to secure union recognition in the early 1940s. Here they are in Kirkland Lake, Ontario in 40 below temperatures forming a 2-mile long picket of women and children to pressure the gold mining companies to recognize and bargain with MMSW. The women were not union members themselves, yet they helped organize MMSW because it was necessary for survival. In the one-industry mining towns there were no jobs for women. An injury, or even worse a fatality, of a husband was economically devastating to the entire family. 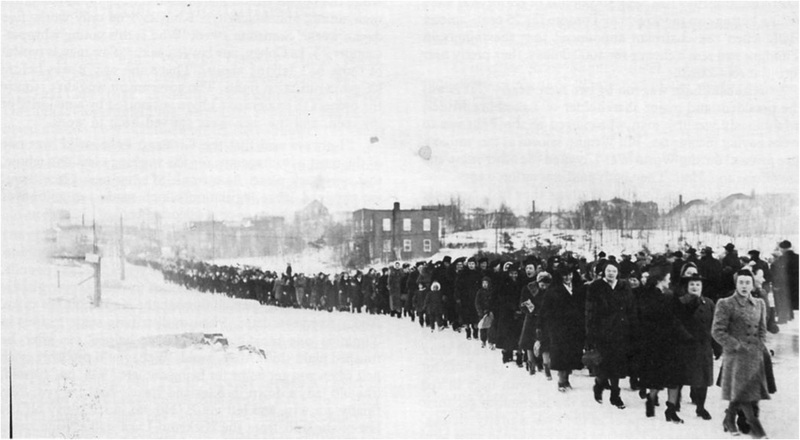 Once union recognition was achieved for workers in Canada in 1943 – thanks to the war-time Labour Relations Regulations, PC 1003, which was extended to cover all workers in Canada through adoption of acts by all the provincial legislatures – the women challenged the assumption that the class struggle could be won at the bargaining table under the steam of men alone. What they were doing were doing at the kitchen tables was just as important. They organized bazaars, movie nights, and Christmas parties for the kids – activities that were crucial to a vibrant social life for the inhabitants of remote mining towns, towns like Kirkland Lake, Ontario, Trail, British Columbia, and Uranium City, Saskatchewan. But, Auxiliary locals were far more than social clubs carrying out the traditional women’s ‘support’ work. Inspired by their vision of a fair and just world, they worked ceaselessly on numerous political campaigns. Their independence from the men’s locals was formalized in the union’s and the Auxiliaries’ own constitutions. The women’s fund-raising activities provided them with some financial autonomy, which they used to support their own political agenda including women’s emancipation. Were the Ladies Auxiliaries dangerous women? Evidently, the Royal Canadian Mounted Police thought so. The Ladies Auxiliaries, along with the men’s union, were under surveillance for close to three decades. Along with other left-led unions, the Ladies Auxiliaries and the MMSW union upheld the post-war vision of progress through labour unity and its active pursuit of broader social goals. The Cold War period made that difficult. In Canada, unions with left-leaning union leaderships were isolated, raided, and ultimately defeated one by one, their leaders branded as subversives and enemy agents. The RCMP infiltrated many of these unions and kept files on their leading activists. Only in the early 1990s, forty years after their covert surveillance did the RCMP admit publicly to their activities, including the role of informants in the Ladies Auxiliaries. Now, we know the history of these women because of the RCMP extensive documentation. Of all the archives containing information on the Ladies Auxiliaries, the most comprehensive source is the RCMP archive in Ottawa. But, what was so threatening about these women that warranted RCMP surveillance? Inspired not by wages but by their dreams of a just and peaceful world, these women worked to an exceedingly ambitious political agenda. Figure 2: “Program for the Coming Year”. 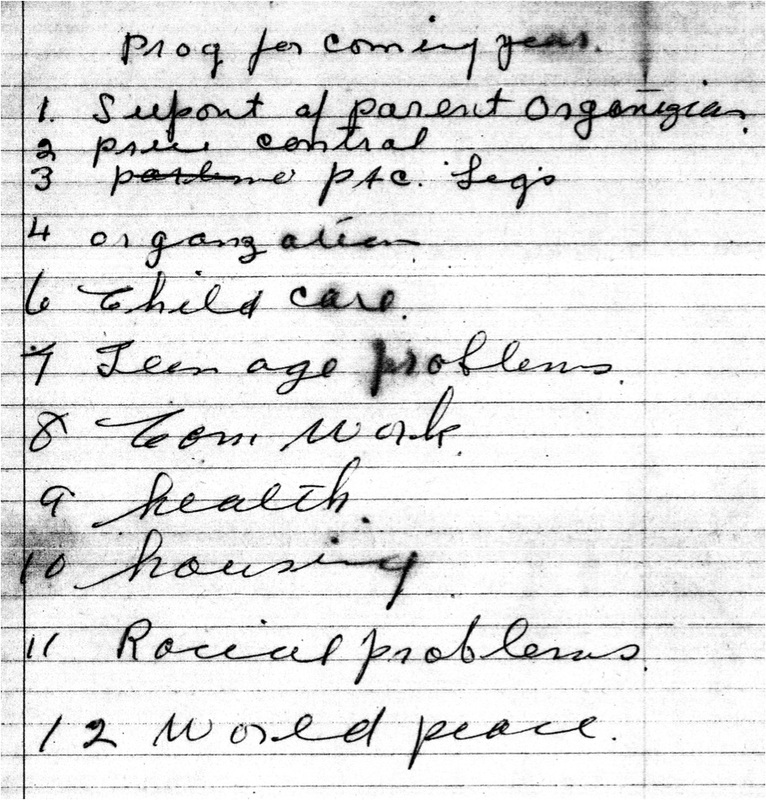 Torn from a recording secretary’s notebook, likely from one of the monthly Ladies Auxiliaries meetings, the list reflects the breadth of their political ambitions. The women both followed and challenged the conventional gender norms of the times. Their traditional supportive women’s work of feeding striking families, organizing massive clothing drives, and visiting the sick in hospital provided a local system supporting the health and welfare of their communities. But, they were more than a ‘reserve army’ of emotional and supportive labourers. Campaigns of all kinds were initiated to reform the capitalist system for a more equal distribution of wealth. Telegrams, postcards, petitions, and letters were regularly sent to politicians. Family holidays were interrupted to protest proposed changes to the criminal code that would compromise civil liberties. While organizing flood relief for victims living thousands of miles away, the women electioneered for progressive candidates in their local civic elections. They formed delegations and travelled to the nation’s capital to interview protest atomic bomb testing and world disarmament. The women advocated for a universal National Health Plan, greater coverage of the unemployment insurance program, changes in sales tax, and other expansions of the welfare state. The Auxiliaries of MMSW pre-dated second wave feminism and the topic of political and economic value of women’s domestic work was not part of the prevailing consciousness. But, their political participation, consumer action, and education were essential to the creation of a new political and social order. “With Glowing Hearts: How ordinary women worked together to change the world (and did)”. The play has now been performed a number of times at the Fringe Festival in Saskatoon and was awarded the “Best of the Fest” award. Laurentian University Archives. Fond P047. Interview with Kay Carlin. Interviewed by Barbara Dunphrey. Tape 4. 1982. Library and Archives Canada, RG 146, vol. 119, pp. 102, file AH2001-00070, Newsletter, No. 297, 1962, 1. Archives Ontario. Fond F1271. Mine Mill and Smelter Workers (Local 598). 1968.